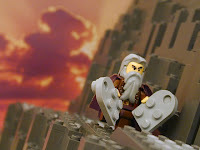 A Lego Moses? Who would have guessed? The folks from the Brick Testament guessed. The Brick Testament is the whole Bible depicted scene by scene in Legos. A few warnings are in order before you check out the site. First, it does depict scenes of a sexual nature in Legos, so be warned. Also, it does depict Jesus in Lego form (sorry RP guys). I am not sure what to make of the site, but I was pretty sure that our readers would find it interesting. I've known about this website for awhile. He is actually Mocking God and the Bible. The "Reverend" is an Atheist. Here is the Reverend's blog. Thanks for the info. I had no idea when I posted the link. But as I looked around the "Brick Bible" more, I had a feeling he was not, at least, an evangelical Christian.